It took about 3 hours to finally pack the motorcycle and get ready for when Ali and Husain ride to my house so that we can meet every one at Kuwait Towers at 4:30 pm. Once we arrived we were surprised by the size of the event and the number of people who showed up to support our trip. We also were very happy to see the head of P.A.Y.S. 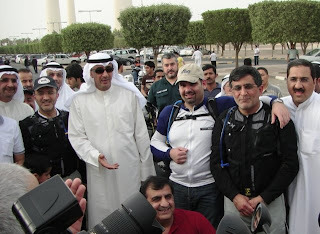 Mr. Faisal Al-Jazzaf had attended personally to great us and see us off. After the pictures and the interviews we set off on our journey as a convoy of bikes and cars headed for the south border (Al-Newaiseeb) where we said our goodbyes and entered KSA. After we finished all the boarder formalities amongst the heat we met up with Noori Al-Khatrash, and Tareq Al-Osaimi, on their Harleys, and Mohammad Ashkanani |(Husain's Brother), Mohammed's Son, and AbdulAziz Abdulhadi (Abu Maitham) in a car to come with us for part of the trip. At this time it was already around 8:00 pm. We stopped for prayers then headed south towards Buhadria, this is when I started to feel tired and had difficulty concentrating on the road. About 40 Km from the boarder I wasn't able to ride the bike. It was a combination of exhaustion, and los of nutrients due to excessive sweating. We were much stressed the few days before we left getting everything in order as well as being excited about leaving that I didn't get much sleep, I had bought electrolytes to mix with my water but was in too much of a hurry to use them. To cut a long story short I sat in the car while (Bu Maitham) rode my bike to Jubail , since we were getting tired and it was really late. We arrived around midnight where we all stayed in a 3 bedroom apartment, while Noori , and Tareq rode back after Buhadria.